Electric Winches come complete with all electrical controls. Connect to a power source and the winch is ready to operate. Remote controls	are available as an option. A proven holding capacity that is certified by an independent testing laboratory. Ball bearings on high speed shaft and large bronze bushings with grease fittings on all others shafts for long life and dependable service. Oversized sprockets and chain for extended life. Precision machined side plates, gears and shafts to maintain proper gear tooth engagements and minimize wear. Improved cable attachment and solid drum gear. Totally enclosed 5 horsepower crane and hoist electric motor with high efficiency gear box attached. Free-wheeling feature to allow faster cable pullout. Provisions for emergency manual operation from three locations. One location utilizes the entire winch gear reduction. Mechanical locking dog for emergency use in case of motor or power failure. Cable guard prevents cable damage from gears. 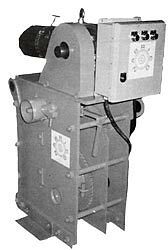 Electric Winch, Nabrico, DF-500-30-7-E 30 Ton Electric. Control Box not included. Electric Winch, Nabrico, DF-500-40-11-E 40 Ton Electric. Control Box not included. The specification and details described by drawings or text in this site are subject to change without notice. 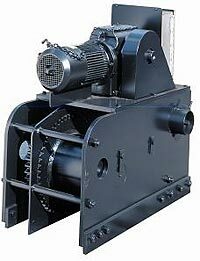 Winches portrayed in drawings, photographs, and copy are not designed for lifting or lowering personnel. DF-500 INCHES INCHES INCHES 1/2 5/8 3/4 7/8 1 HP. LB. (1) These capabilities are based on uniform cable winding. (2) The amount of tension applied when spooling the cable will also affect the length. Educate men without religion and you make them clever devils.